“Inny Świat” (Different World) is mainly an anarchist magazine. Of course, the beginnings were different, as initially it was a fanzine concerned with music and social matters as well as issues connected with opposing the state, fight for animals’ and human rights, ecology and all matters considered as being the part of independent (from what?) movement. A typical fanzine, issued first in 1993, developed into a magazine concentrated solely on freedom fighting or anarchist matters. We looked at freedom form different perspectives, which we intend to continue and which is not always widely accepted. At the end of 1997 the name “Inny Świat” covered a books and booklets publishing house. Until today 20 books have been published. 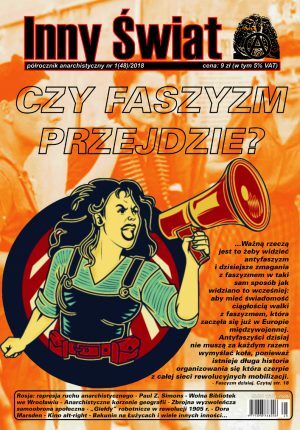 The “Inny Świat” publishing house aims at presenting anarchist propaganda (that was the main subject of some of our books) as well as history of freedom movement and propagating its various streams.